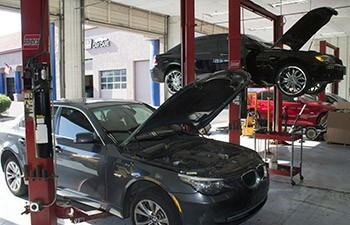 Arizona Bimmer Motor Werks is your dealership alternative for BMW repair in Mesa, AZ. Owned and operated by Nick Fouts and Cody Miller, BMW Master certified technicians. 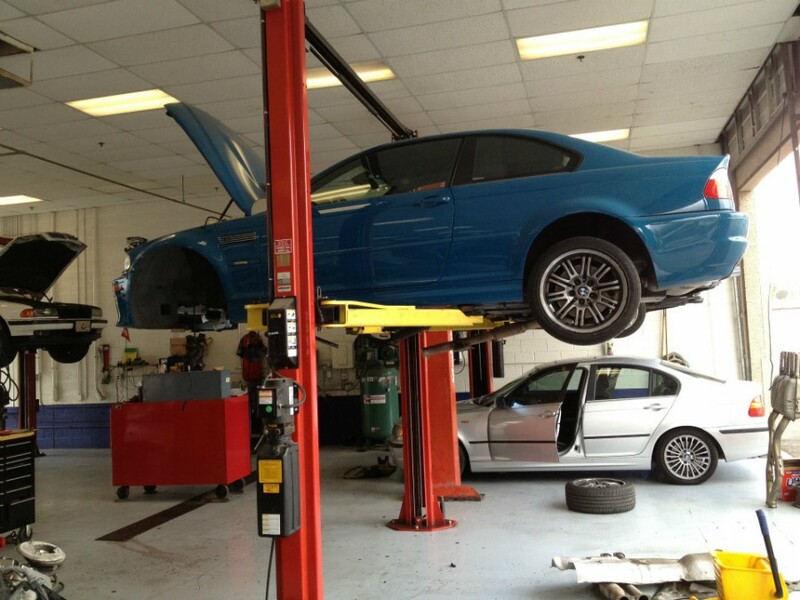 We use factory equipment and the latest technology to service your BMW. We pride ourselves in offering high quality service at the most affordable price. Arizona Bimmer Motor Werks is the Best Shop Ever! They know their stuff, true experts! Fair prices and get it done on time and wash your car! I've been to many garages in Canada and I have yet to find one that provides this quality of service and expertise. We visit Arizona every year and for the last two we've taken our BMW 530 into Arizona Bimmer Motor Werks. Not only is the diagnosis accurate and detailed but the quality or repairs and customer service are exceptional. I have no problem giving this garage and staff a 5 star rating. Thank you Cody and Nick and your knowledgeable and professional mechanics. Nick and Cody at Arizona Bimmer Motor Werks are the best! I took them my 2007 M5 to get all the ECU software updates that the dealership never bothered to apply. I dropped off my BMW in the morning and they had it all finished and ready to go by the end of the day. The service was truly outstanding and the cost was a fraction of what I expected. I don't believe you will find more honest, friendly, or knowledgeable BMW technicians anywhere in the valley. I'll be taking my car to them for everything from now on, and I highly recommend them to everyone! I'm stickler for customer service. Especially when having to spend amounts that contain commas in them ($1,000+). Nick and Cody are by far the BEST BMW mechanics I have ever come across. Their labor rates are lower than ANY BMW shop I've dealt with and the service they provide their customers is amazing. I always joked that BMW = Break My Wallet... But with AZ Bimmer Motor Werks I no longer dread regular scheduled maintenance or repairs. They regularly service my 2004 BMW Dinan 545i and have always been reasonably priced and quick to return my vehicle to me (washed & shiny even). Don't go anywhere else. These guys are like a broken drum... YOU CAN'T BEAT THEM! I love, love, love this shop. They are knowledgeable, friendly and take time to explain what it is they are doing and what work absolutely needs to be done. If there is something that needs fixing but doesn't have an immediate need, they will let you know that, too, so you have a choice. I cannot praise Arizona Bimmer Motor Werks enough. Their prices are amazingly fair and you get a car wash after every service to boot! You can beat 'em -- anywhere. The comment of Jonathan reflects 100% my experience so on my behalf I hereby copy his statement: I have had my BMW X5 serviced at AZ Bimmer several times now. Nick and Cody are always courteous and helpful as well as honest and knowledgeable. They service cars quickly and their pricing is much less than the dealership. I have had my BMW 745li serviced at AZ Bimmer several times now. Nick and Cody are always courteous and helpful as well as honest and knowledgeable. They service cars quickly and their pricing is much less than the dealership. These guys really know what there talking about and will answer any question about your BMW. Have done service at Arizona Bimmer Motor Werks a few times and will continue to do so. Turned off error light & inspected everything for no chg. $70 for oil service. Don't waste your time shopping around, this is the place to go! 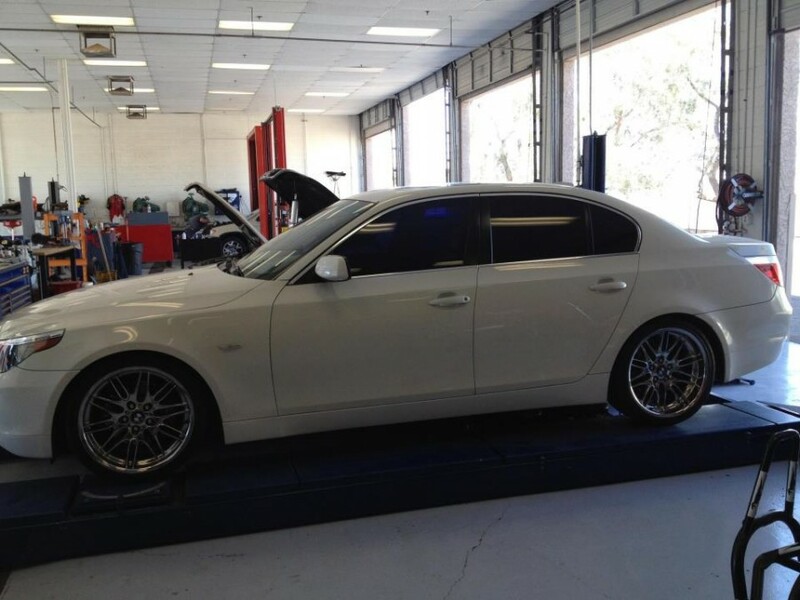 I had a very nice experience with my BMW service at Arizona Bimmer Motor Werks. The owner was friendly and helped me get my BMW back into shape without breaking my pocket book. I highly recommend this shop to anyone! i am the proud owner of a 1998 BMW 750il (also referred to as a V-12 time bomb) that developed some squeaks, clunks, and a driver's seat that would start to adjust by itself if you turned the radio volume up! Cody was very helpful, solved all of my car's problems, and actually returned my phone calls! I highly recommend Arizona Bimmer Motor Werk ,to all V-12 BMW owners! I made a stop into AZ Bimmer Motor Werks to have a coolant leak checked out. The technician pressure tested my system and found a small crack in the side of the coolant expansion tank of my 2004 745li. He put together a quote for me, checked my vehicle over for any other needed repairs and gave me an estimate to fix the car.. I agreed and the vehicle was repaired and ready to go in no time. The repair work was great and the customer service was wonderful! I recommend Arizona Bimmer Motor Werks to all BMW owners. My 03 745i was at another European independent shop for an oil service, the shop was unable to reset my indicator light and i felt that the service was poor. I found Arizona Bimmer Motor Werks and stopped in to talk to them, they are very knowledgeable and performed a free vehicle inspection for me, showed me a few problems with the vehicle that they were able to repair right there while i waited. The service was top notch and the price was very fair, they even reset the indicator light that the other shop couldn't! These guys are great and I will keep my BMW serviced here from now on. Arizona Bimmer Motor Werks provided fast and professional service! I also found Arizona Bimmer Motor Werks service on the internet. Brought my "New to Me" 2001 330i in for oil and a check-up. Cody and Nick were very professional and very well informed. They showed me the in's and out's of my car. I highly recommend them for any BMW service and/or repair I may come to need. I will be back to them for any service I require. Thanks for the great service and nice shop! I just had front and rear brakes replaced on my 02 745i over at Arizona Bimmer Motor Werks. They did the brakes quickly and used factory BMW parts. I got quotes at both the dealer and other local independent shops but these guys are the best bang for the buck in the valley! I found the shop to be very professional and the work area clean and organized. Great shop! I found Arizona Bimmer Motor Werks on bimmershops.com last week, i went in for a repair Friday and the part I needed wasn't available, the guys there ordered the part over night and actually came in on Saturday when they weren't even open just to get my car fixed for me! I will tell every BMW owner I know and meet about this shop, and will continue to have them do all the work on my vehicles. Thanks guys. I have a BMW 540 and I had a bad oil leak. I went in to Arizona Bimmer Motor Werks and had it fixed, and the mechanics weren't pushy with other repairs. I've gone to the dealership and they make every repair sound like a life or death situation. These mechanics actually showed me the different problems with my car and let me choose what I wanted to fix. I brought in my 2003 M3 into Arizona Bimmer Motor Werks for a check engine lamp on and oil change. I was greeted by shop owners Nick and Cody with friendliness. They said they were very appreciative that I chose them to bring my vehicle to them for BMW service. Within the day, my vehicle was fixed at a reasonable price. I will definitely recommend them to any friends of mine that have BMWs. My BMW 525 has always been serviced and maintained by the dealership -- that is until Arizona Bimmer Motor Werks opened. The professionalism, attention to detail, and experience of the team gives me complete confidence in their capabilities to keep my vehicle running at peak performance. I would (and do) recommend them to any of my friends and family. If you have a BMW, they are the folks to call! I took my 99 BMW 323 into the dealer for some service. They were unfriendly and very over priced. 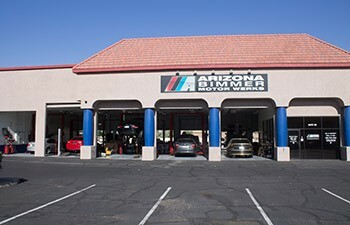 I did a search for some independent BMW shops and found Arizona Bimmer Motor Werks, they treated me great and serviced my vehicle at a fair price. The work was quality and i will continue to take my vehicle to them!